Super Sneak is the game that managed to catch me lately so I decided to give it a short review here on my blog. When I first started it, I got instantly intrigued by the introduction screen that tells the funny story of a guy called Rusty that propose to his girlfriend Sophie. 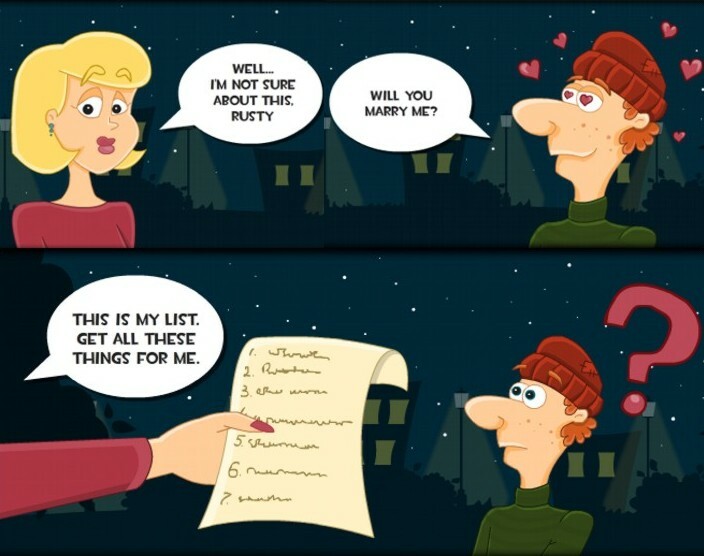 He doesn’t get refused yet in order for him to get married he needs to satisfy several desires to his girlfriend just like in romance fairy tale. Sophie isn’t the kind of nice princess one would expect, as her desire for expensive jewelry, cars and fancy clothes puts Rusty face to face to almost an impossible situation. 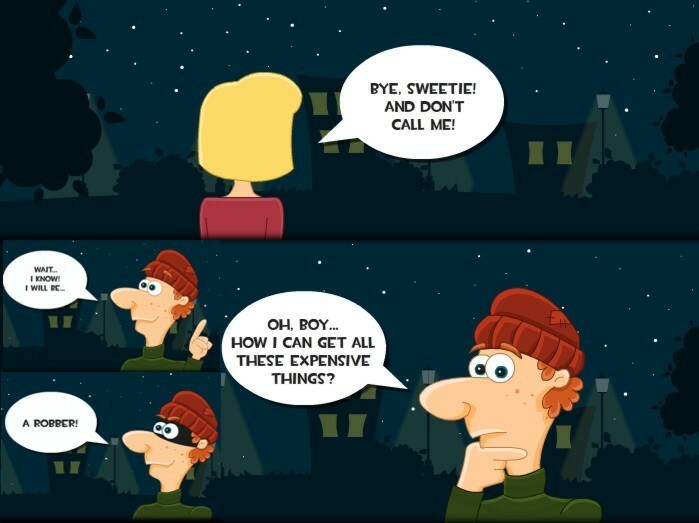 Yet the young male somehow manages to kind of sort it out once he gets the crazy idea of becoming a robber in order to be able to gather all the money needed for buying the things from the list Sophie handed him just after he proposed to her. From now on Rusty turns into a felony and starts looking for potential places that he can rob and steal money from. First level is kind of easy to complete as Rusty can collect some of the precious dollar bills right from the streets, so there is no actual robbery involved at first, yet he looks suspicious enough to the police patrol so that he must stay under the radar and avoid getting spotted, by not entering the light beam that comes out from the police flashlight. 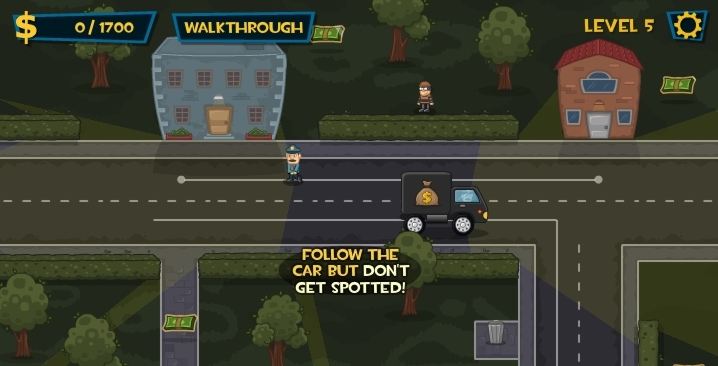 Once he manages to gather the minimum amount of money necessary to end this first mission a get away car appears on the screen on our character must reach it in order to proceed further. There is no accomplice presented in the introduction scenes, yet Rusty probably got some one to help as the car get away car needs a driver. Who could be Rusty’s accomplice,maybe Sophie, who knows we might never sort it out, but now that our guy got his hands on the first money he can proceed further to the inventory shop and start buying some things from the list. 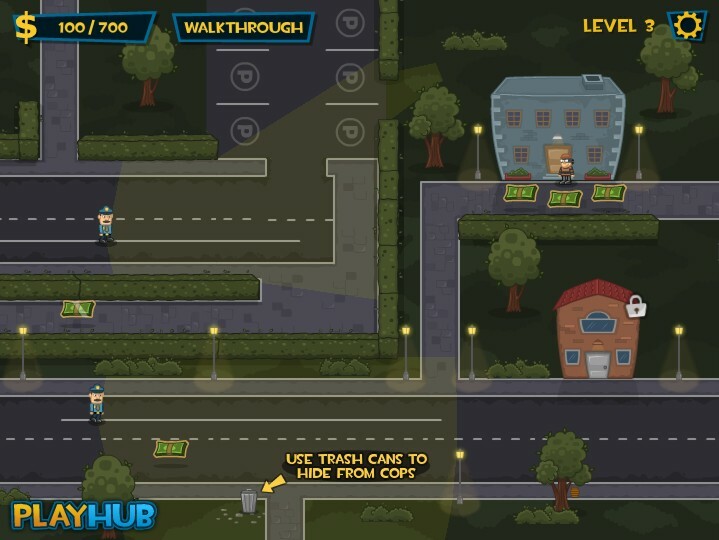 As the player advances through the levels, higher amounts of money needs to be collected so Rusty must diversify his actions by robbing banks or even money transportation vehicles. He also gets clever as the money starts to flow so he rob the donut stores in order to place donuts in different places on the map so that the police patrol would take some rest time, eat the donuts and lose their vigilance for a while. Before taking action Rusty looks for blind spots inside each level so that he can use it as a safe area in order to hide from the light beams. He can also hide inside trashcans that can be found of the streets, yet this would be effective only if he didn’t previously got spotted by an officer. Higher levels are more complex as Rusty has to deal with sophisticated alarms and other increased security measures for the buildings he tries to rob so he first needs to find some special tools and this adds more stress and danger for him. If you do get spotted by the police you still can escape by running and trying to lose your tale inside some blind spot areas from the map. But one question still remains: What happens once Rusty manages to buy all the things his girlfriend asked for,will she marry him just as promised or he risked his life all in vane. Well I let you find the answer to this question yourself by playing the game and trying to finish it as it involves almost an hour of having great fun.